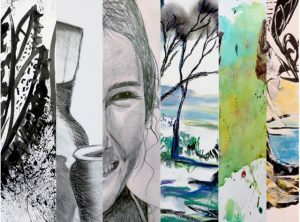 Professional Artists and Art Tutor Kerry Wilson is holding a number of great classes at the Butter Factory Art Center in Cooroy over the coming months. Kerry previously held art classes at the New England Regional Art Museum and was the Visual Arts Teacher at TAFE NSW from 2008-2012 – She now Teaches Visual Arts at Sunshine Coast TAFE as well as exhibiting her own work and offering workshops for Adults and Kids locally. We are delighted to make details available here and further information can be found on Kerrys own website http://www.kerrywilsonartist.com/workshop-news Please contact Kerry directly to book. 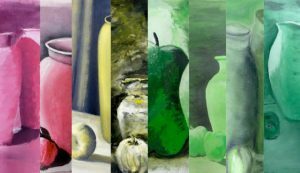 This six week course on acrylic painting covers technique, equipment, colour mixing, acrylic mediums, composition, subject and style. Professional artist and teacher Kerry Wilson will take you through the basics of acrylic painting. Learn impasto, glazing, dry brush and blending while understanding the use of various colour schemes and compositional devices. Experimental subjects and techniques combined with traditional approaches aim to create engaging acrylic paintings. If you have always wanted to paint you will find out how easy it is to start. If you have been painting for a while this course will help develop your practice. This series of drawing classes with professional artist and teacher Kerry Wilson starts 5th August. Six weekly projects will take you through the elements of drawing. Come and explore a variety of media such as graphite, charcoal, ink, pastels and gesso. A range of subjects and techniques aim to create engaging drawings. If you have always wanted to draw you will see how easy it is to start. Experienced artists will find these classes provide fresh approaches and expand their practice. 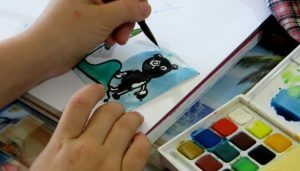 Children’s drawing classes programmed to foster enjoyment of drawing and develop skills using a variety of materials; pencil, ink, charcoal, pastels and paints. Children aged 5 to 12 years will learn drawing skills and techniques with an experienced art teacher and exhibiting artist, Kerry Wilson. Bring any drawing gear you have, pencils, pens, pastels and a sketchbook. Extra materials will be supplied.